The U.S. Consumer Product Safety Commission (CPSC), in cooperation with Sprout Stuff, of Austin, Texas, is announcing the recall of about 40 Sprout Stuff infant ring slings. CPSC advises consumers to immediately stop using these slings due to a risk of suffocation to infants. CPSC and Sprout Stuff are aware of one report of a death of a 10-day-old boy in the recalled sling in Round Rock, Texas in 2007. 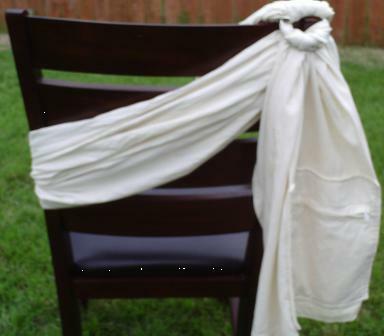 The Sprout Stuff infant ring sling is fabric/natural muslin and comes with or without a shoulder pad. The sling is worn by parents and caregivers to carry a child up to two years of age. “Sprout Stuff” is printed on the back side of the tail’s hem. Sprout Stuff sold the recalled infant slings, which were made in the United States, directly to consumers between October 2006 and May 2007 for between $35 and $45. Sprout Stuff is directly contacting known purchasers of the recalled infant slings. Consumers should immediately stop using the recalled slings and contact Sprout Stuff to return the sling for a full refund. Contact Sprout Stuff toll-free at (877) 319-3103 anytime, email the firm at sproutstuffrefunds@gmail.com or contact the firm by mail at Sprout Stuff Refunds, P.O. Box 612, Buda, Texas 78610. It is important to know that sling baby wearing can be done properly and safely. This recall does not say how the product caused the baby to suffocate just that it did. Baby wearing parents should always watch their child to make sure that they are not trapped or wedged in a way that will prevent them from not breathing properly. After Infantino recalled their 1 million slings in March Jun-Nicole Matsushita, an Iowa City labor doula, spoke to the Press Citizen about what fabric that is easy to breath through, and how to tell if the baby is being held too low. “They need to be high enough … so they’re close enough to kiss,” Matsushita said. Photo Gallery: Baby Wearing Mamas All Over The World!